Las Vegas, here he comes! 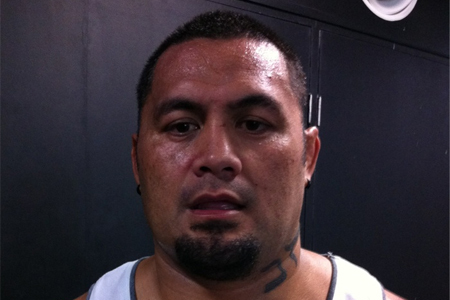 Thirteen days after getting denied at a New Zealand airport, UFC heavyweight Mark Hunt (pictured) has finally obtained a visa to enter America. “Thank u for my visa father,” Hunt tweeted Sunday afternoon. Hunt is slated to co-headline UFC 160 opposite former champion Junior dos Santos. The veteran was initially hoping to arrive in Vegas a couple of weeks early so he could get acclimated to the time zone changes before Saturday’s shootout. “The Super Samoan” is expected to be on a plane by late Sunday or early Monday. Hunt has remained vague as to why he’s had complications with his visa, but it appears to be linked to a 2002 arrest when two of his friends were involved in a fight. UFC 160 takes place inside MGM Grand in Nevada. A heavyweight title tilt between champ Cain Velasquez and Antonio “Bigfoot” Silva headlines the gig. It is believed a victorious Hunt or dos Santos will get next dibs at the crown.